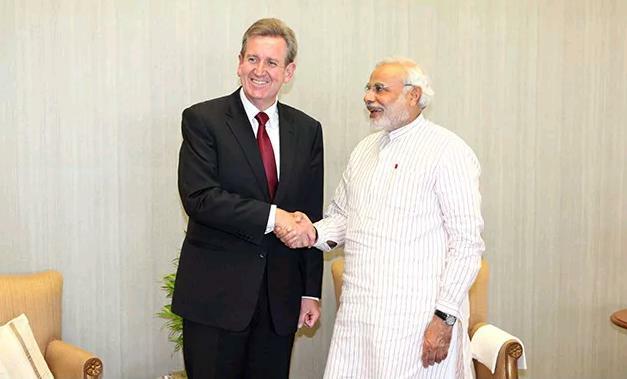 Barry O’Farrell, Premier of Australia’s most populous state New South Wales (NSW) expressed his happiness on meeting Gujarat’s Chief Minister and BJP’s PM candidate Narendra Modi. 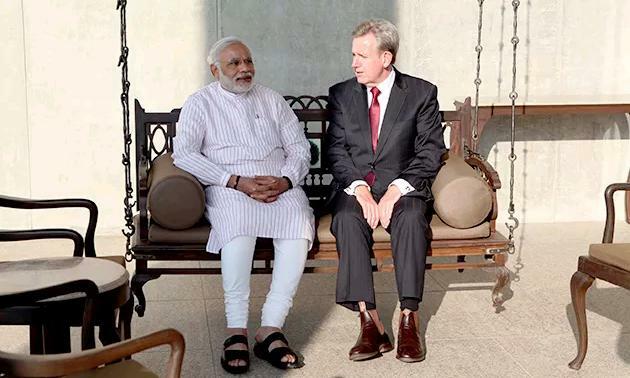 In his third visit to Gujarat, O’Farrell is leading a state delegation of ten members to explore venues for enhance mutual co-operation in number of areas like infrastructure development, technology transfer and education. In education and skill development sector areas being explored are technical education courses for skill development with Technical and further education NSW (TAFE), tie-up with Yoga University and Sports University, developing renewable energy sector like rooftop solar technology and dairy technology. Along with other notable members from Business and government, Australian consul general Marc Pears accompanied O’Farrell.